The Hello Kitty Cafe will be visiting The Avenue at White Marsh on April 15, 2017, from 10 a.m. to 8 p.m. 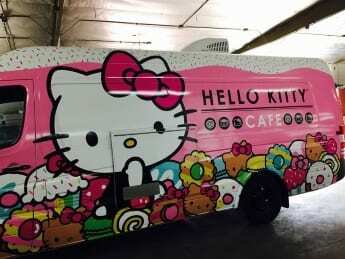 The mobile pop-up shop is a food truck that offers artisan pastries, petit four mini cakes and gourmet chocolates with a Hello Kitty twist. Hello Kitty is the cat-like character created by Japan’s Sanrio. Over the past 40 years, Hello Kitty has become a merchandising phenomenon — appearing on everything from jewelry to dust pans. Sanrio’s website describes her as a little girl from the suburbs of London who lives with her parents, twin sister Mimmy and her own pet cat Charmmy Kitty. The Hello Kitty Cafe will be located on the side street by Barnes and Noble. For more information, visit the event on Facebook by clicking here.